First performance : Kansas City, July 5, 2018. Todd Wilson, organ, National Convention of the American Guild of Organists. In music, the basic unit of time - the beat - conveys an almost palpable, physical energy, like the oscillations of the pendulum of a clock whose ticking puts an end to silence. In The Hands of Time, the organist?s hands recreate the delicate, constant movement of the hands of a clock and the subtle, perpetual dance of the heavenly bodies among the stars. This almost palpable connection is a preamble to the poetic dimension of the piece. First performance : Orangerie de Bagatelle (Paris), May 27, 2017. First performance by François Salque. This Chaconne begins with a grand but almost imperceptible theme, which is often the case of large landscapes or monuments like the breathtaking Niagara Falls, for example. The extreme simplicity of this theme becomes increasingly turbulent and complex. It is the warmth of romantic piano that I wanted to mention here, but as suggested, dispassionate, giving way to the one soul of the instrument that unfolds before returning to the vastness of the resonance. Agartha is a legendary kingdom that would be connected to the five continents through an extensive network of tunnels and underground tunnels. This belief is found in Antiquity. According to legend, there would still be large portions of these galleries, the others having been destroyed by geological shifts. The mystery remains. Indian Rock pays tribute to the famous harpsichord piece by Jean-Philippe Rameau (1686-1764), "Les Sauvages", published in the third book of 1728. 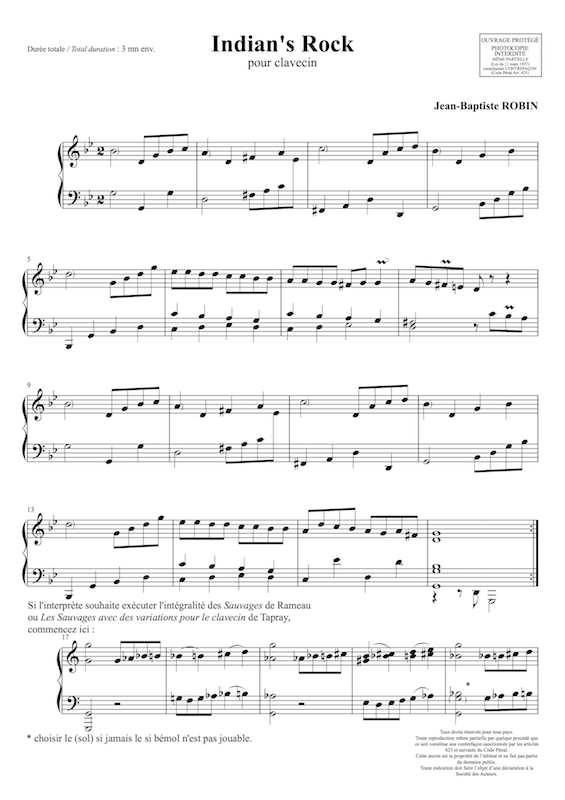 Rameau reuses this dance in 1736 in his opera-ballet "Les Indes Galantes" and Jean-François Tapray (1738-1819) composes later remarkable variations on this work. On the occasion of the 2014 Rameau year, I wanted to use this emblematic musical theme of the 18th century and immerse it in a world of today. The work uses and develops each motif of the theme in various climates, alternately tormented, dreamlike and joyful. Only to the extent that a new "hyper-savage" and almost tribal figure appears. This motif will be superimposed on Rameau's theme and plunge him into an almost heavy-metal electric universe (a wild style of today's music). 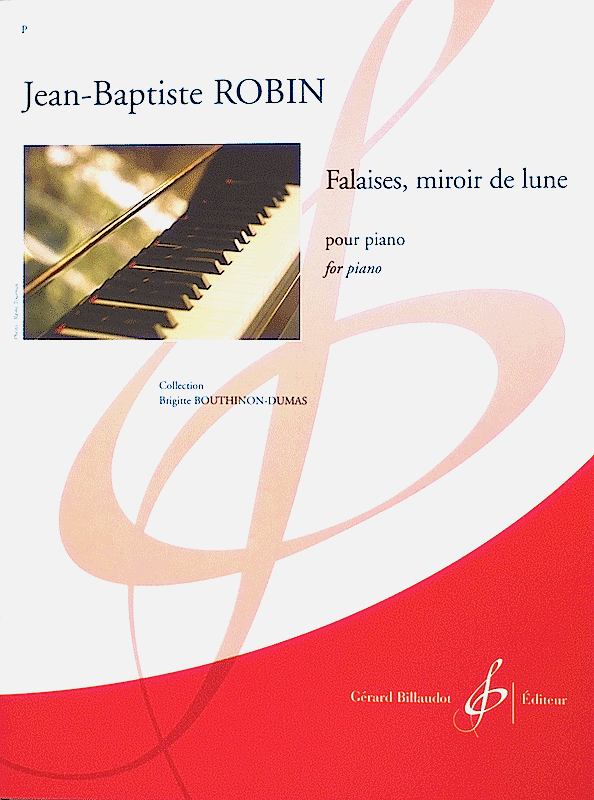 This piece was conceived for French-style harpsichords, but it can be performed on different types of instruments such as pianoforte or piano (it is then necessary to imagine nuances). The writing is respectful of the old instruments and can be treated with all the sophistication of touch that one brings to an old work. 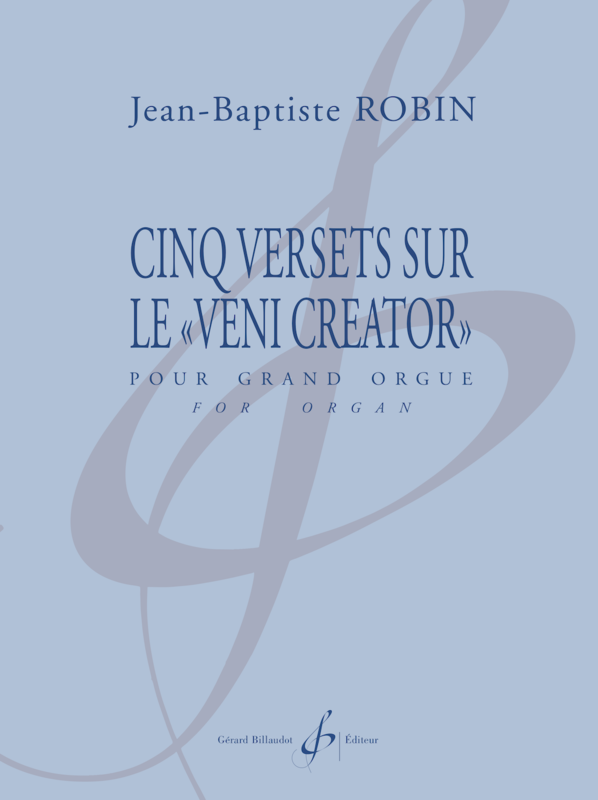 The five verses composed here constantly employ the original melody of Veni Creator, either in fragmentation, or as long musical phrases. The original plainchant permeates the entirety of this work, even if the musical language and universe are personal creations. 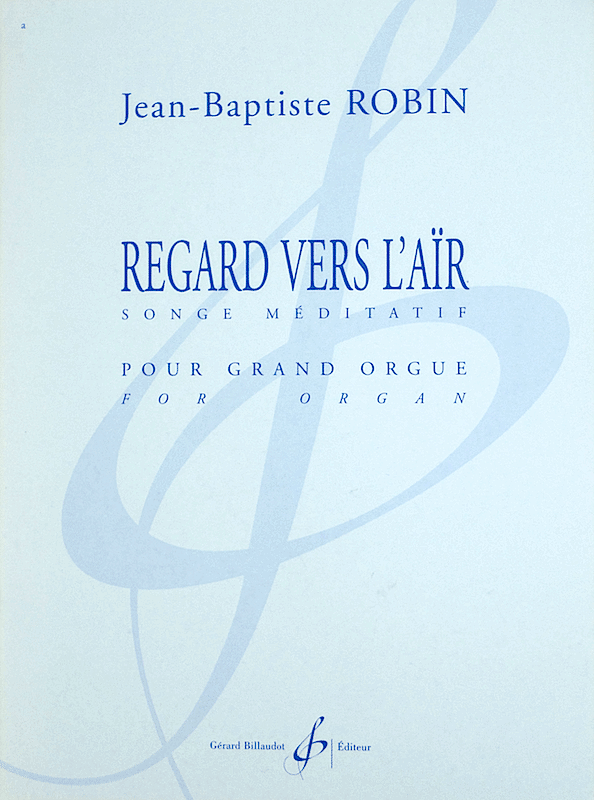 This is a Christian, poetic and spiritual work, the music is constantly figuring the text, reminiscent of some baroque composer's way of writing. 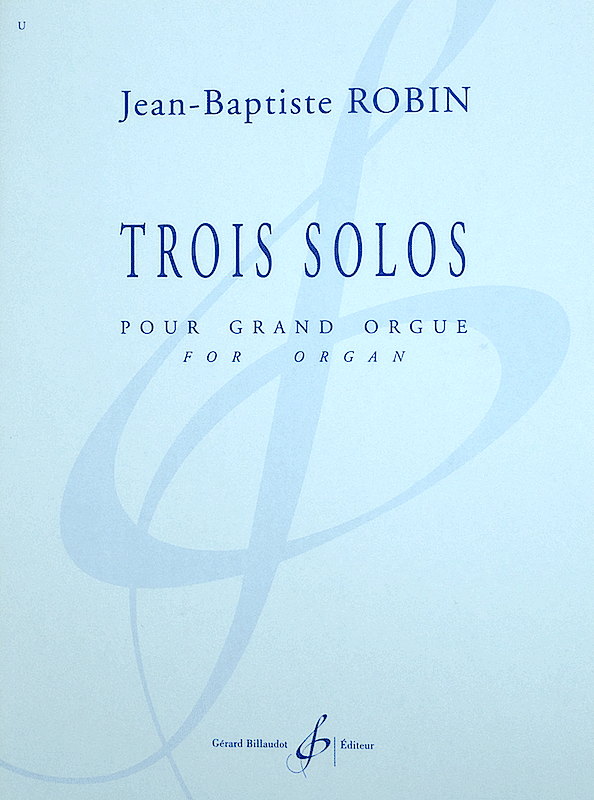 These Three Solos require neither a page turner nor a registrant and are of intermediate technical difficulty. 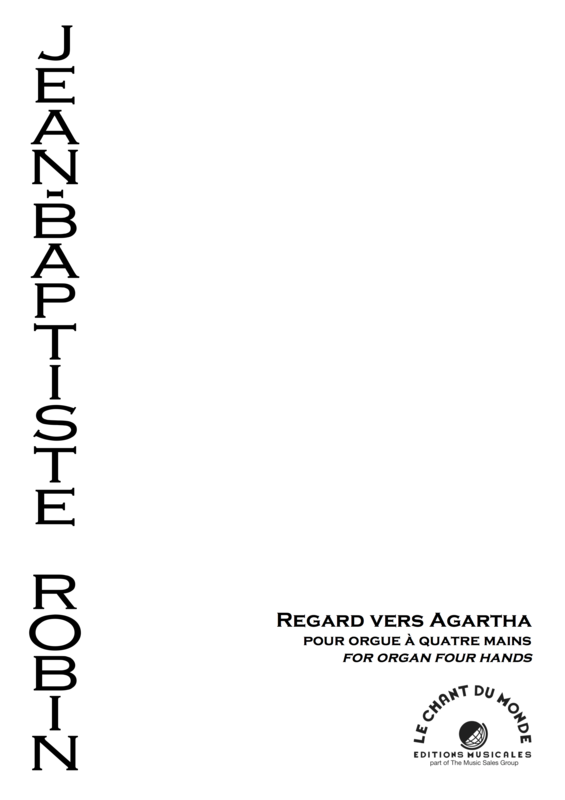 Although conceived for a French classical organ of mesotonic temperament, they can equally well be played on instruments of different style and temperament (German baroque organ, Symphonic organ, etc.). It is important that the acoustics of the performance venue be quite resonant. First performances: Dresden Cathedral (G), June 29, 2011 by Frédéric Champion, Poitiers Cathedral, September 24, 2011 and Pensacola (Florida), October 23, 2011 (J.-B. Robin), Grand Séminaire de Montréal, October 30, 2011 (J. Korndörfer), Chapelle royale du château de Versailles, December 17, 2011 (JBR), Saint-Donat, July 16, 2012 by Vincent Warnier. 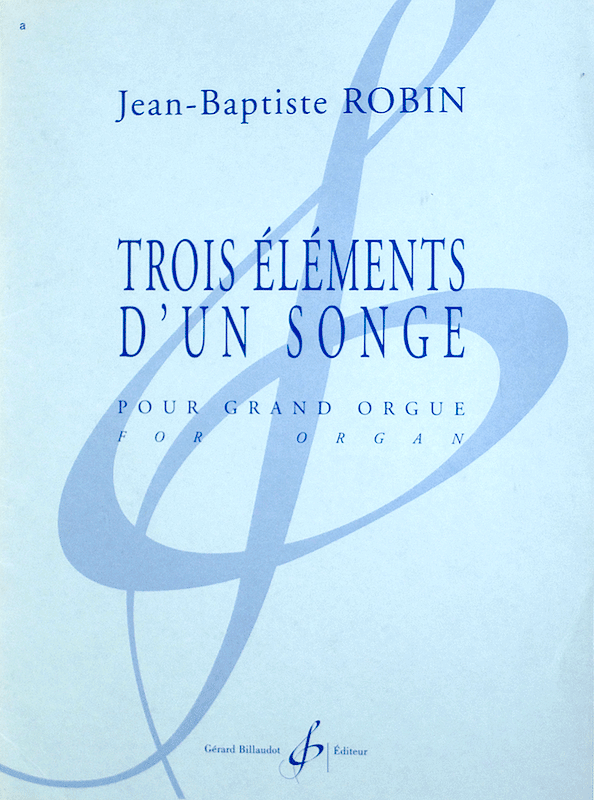 This work revolves around a central piece entitled Reflecting Circles, the nucleus of the work, which employs a compositional technique of almost absolute rigor in regards to the pitch of the notes. Each note is linked to another via melodic symmetry, either modal or harmonic. Six other movements are arranged in symmetry around this piece, each being linked to another, using the « reflecting » compositional technique in a more suggestive manner. This work is a dialogue between two themes: the "Circle" and "the Child". The Wind is itself evoked by the breath of the dynamic start of the work and by the delicate breezes of the end. - page 9, mes. 37: registrations indication, cancel Réc. and write Pos. - page 20, mes. 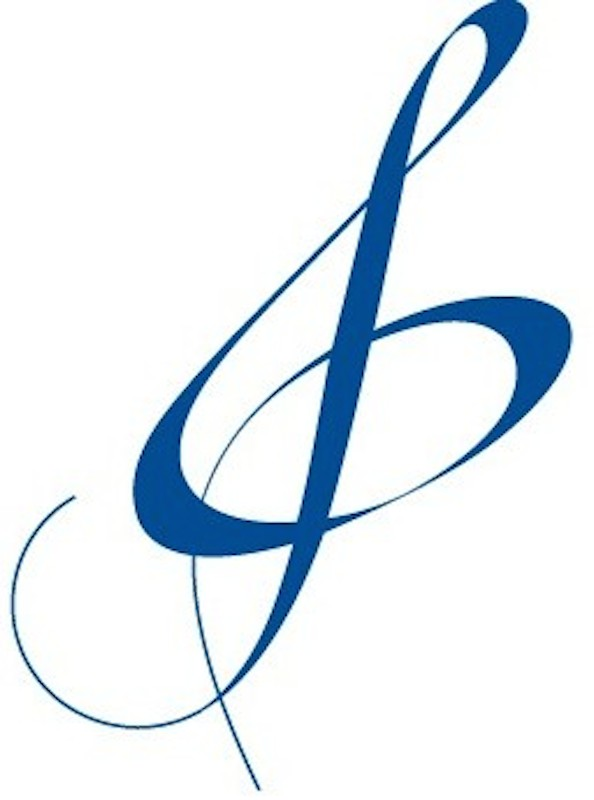 30-32: change F clef on left hand staff by G clef. Three Elements of a Dream is based on two simple musical ideas: three intervals and a twilight harmony which is introductory and conclusive (first chord of Crépusculaire). 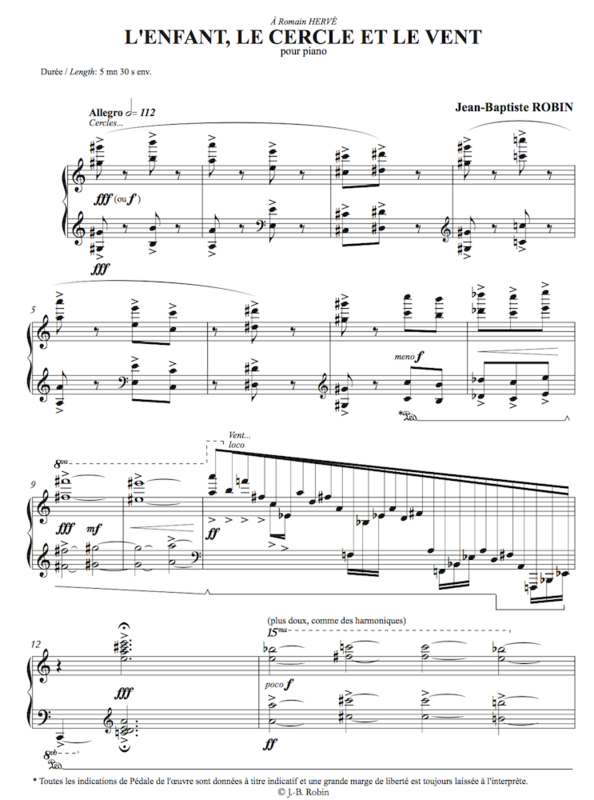 The poetic frame of the work comes from these elements, and the first two movements are like an anacrusis to the last piece which is deeply peaceful. 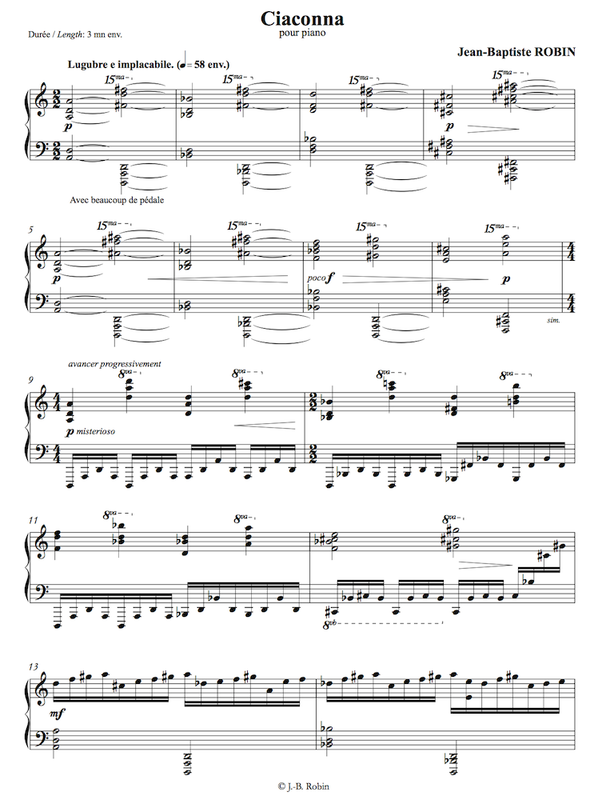 The work begins with the exposure of three ideas: a contemplative melodic theme (illuminated by delicate high notes that evoke a night light), a harmonic theme (in the form of enveloping chords recalling the resonances of a gong) and a dancing rhythm and discontinuous theme, increasingly ubiquitous. Errata: bar 19, the last B of the bar is flat (the B before the C flat). As the work unfolds, two opposing themes develop, the first getting shorter as the second lengthens. This thematic development unifies a succession of very different atmospheres: the never-ending knell of the opening, the Asiatic mode arabesques which follow it, or the two echoing melodies that bring to mind two children playing chase. The work also brings out several unusual colours on the harmonic stops (Nasard and Tierce), musical evocations of wind and ocean waves. This piece in no way seeks to portray the Aïr Mountains in Niger. The title is simply an invitation to go on a purely imaginary journey and was inspired by the imposing harmonic landscapes of the final pages.